We write this on Bastille Day, which commemorates the storming and seizing of the infamous French fortress by revolutionaries. They were determined to make the 1 percent pay for the injustices they believed were heaped upon them. And pay the French ruling class did – many of them with their heads. It is also fitting that Bastille Day is being celebrated in France by two world leaders who owe their power to the same type of class resentment that sparked the French Revolution. Donald Trump rose to power largely due to the frustration of the slipping fortunes of the white middle class – a group who has seen their futures dissolve in a tidal wave of globalization and technology. Emmanuel Macron was elected for many of the same reasons. An outsider like Trump, Mr. Macron was the answer for the majority of French people who wanted change, but not the protectionist, right-wing policies of Marine La Pen. The French Revolution is just one example of extreme wealth disparity leading to violence and social upheaval. History is full of others. So is the present. The sharp division between red and blue America is another modern-day manifestation of growing social volatility due to wealth disparity, worse than at any time since the Great Depression. The last time the wealth of the richest 1% of Americans exceeded that of the poorest was during the “Roaring Twenties. The Roaring Twenties were great if you owned stocks and real estate but, like today, not so great if you were a working stiff. Disillusioned with politicians that did little to help the working man, Americans elected Herbert Hoover in 1929. Like Donald Trump, Herbert Hoover was a successful businessman with little experience in politics. A Republican campaign circular released in 1928 promised a “chicken in every pot” if Hoover was elected. It was a good slogan and it paid off. Hoover was elected, but he was unable to stop the natural turn of an expensive stock market and an overextended bullish market cycle. President Trump also ran a successful campaign with a good slogan and the stock market is giving him a vote of confidence. But the market, like Hoover’s, is expensive. At almost 100 months (the second longest in history), it is getting long in the tooth. Social volatility has not been matched by financial volatility – yet. VIX has spent a lot of time flirting with the low end of 10% and has even dipped below it a number of times. How long can this last? The market is counting on tax reform and massive infrastructure spending to calm the financial anxiety at the root of America’s social volatility. These are two things that, if worked on diligently, could generate bipartisan support. Yet we’ve seen neither: no reform and not one penny for infrastructure. Instead, Washington is bogged down with healthcare – something not even the party in power can agree on. We believe stocks will lose patience unless this gets squared away soon. America’s social and political volatility will bleed into markets much the same way the discontent of the late 1920s led to the Depression of the 1930s. 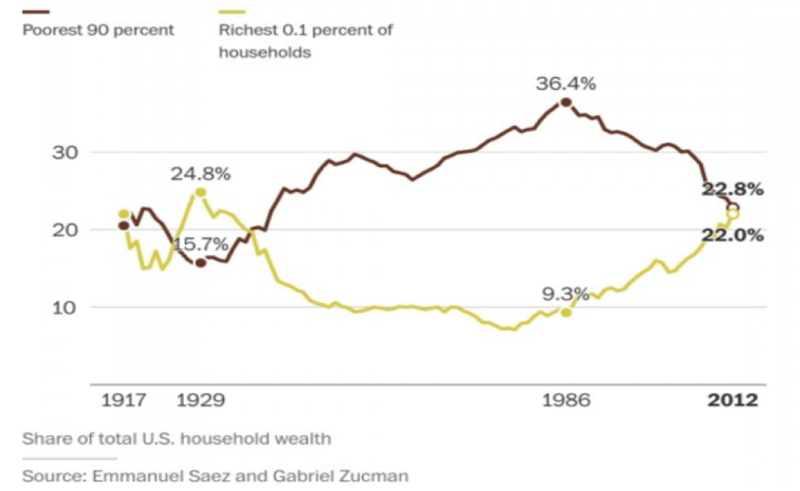 You’ve probably seen this chart before, but it is worth seeing again – especially in conjunction with the chart of income disparity displayed earlier in this blog. It measures the Shiller PE ratio for the overall market. Stocks are as expensive now as right before the 1929 crash. And while this does not mean we expect a crash tomorrow, it does signal trouble on the horizon. Add growing global instability – North Korean nukes, Russia election meddling, Chinese expansion in the South China Sea, the civil war between Sunni and Shia in the Mideast, any of which could lead to a shooting war at the drop of a hat – to an expensive American stock market and a pissed-off public and the odds of a serious correction in financial markets grow by the day. Most investors are not ready to weather the coming storm. That’s why diversification is so important. Managed futures are not correlated to the movement of stocks and bonds, making them an excellent way to diversify a traditional portfolio heavy in stocks and bonds. Managed futures have the ability to make money in both up and down markets. Have you explored this little-known asset class? If not now, then when? To find out more about the Managed Futures programs the RMB Group is currently following – or to get more information on Managed Futures in general – give us a call toll-free at 800-345-7026 or 312-373-4970 direct. 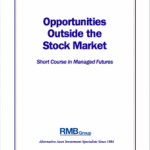 You can also visit our website at www.rmbgroup.com and download our Managed Futures primer “Opportunities Outside the Stock Market” along with a companion video.